Peeling/extracting crab meat is a royal pain in the buli (rear) unless you take odd pleasure in the task… Hence it isn’t often you find crab omelettes anymore. Not to mention the peeled crab meat is pricey, whether or not you do it yourself… So the idea was to re-reate a “comfort food” from my childhood, but make it easy for customers to enjoy it. 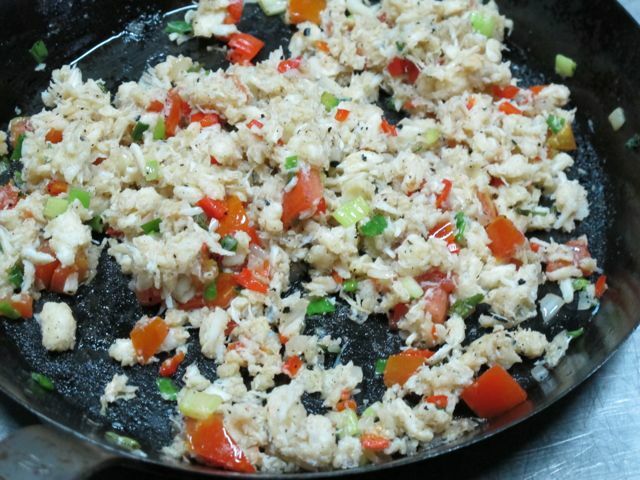 Take a generous portion of peeled and cooked crab meat, saute some onions, garlic and tomatoes in butter, season with salt and pepper, add some chopped herbs until just warmed through. 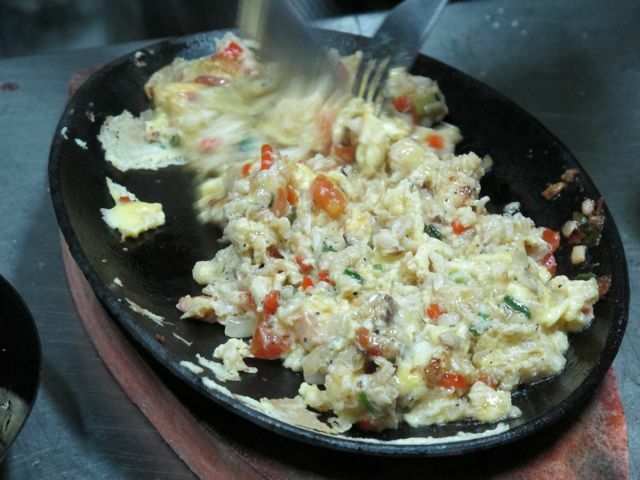 hmm crab sisig…will try these recipe with toppings of aligi..
JLA – omg, aligue! brilliant. Looks delish! 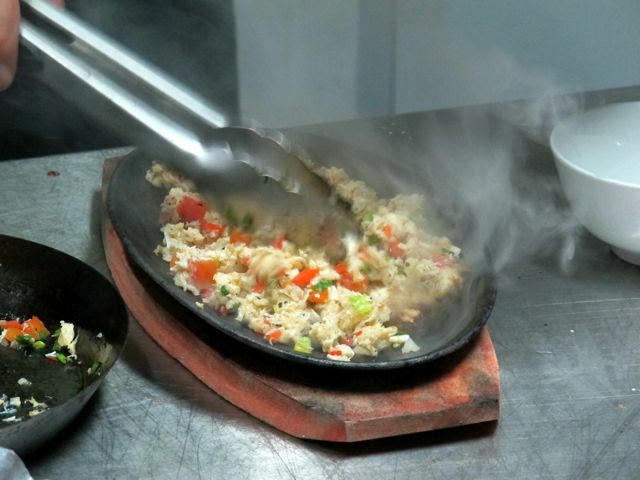 Are the sizzling plates teflon coated or seasoned cast iron? I remember aligue to be a bit salty. A favorite “quick dish” would be to just spoon aligue over hot white rice, and mix it up like “star margarine”. Naglalaway na ako just thinking about it. So are you serving this in the restaurant? I am sure this is tasty since it contains crab meat but half of the eating is done by looking as it is often said (usually by me). Sizzle seems to have trumped visual appeal here. I would gladly serve it privately to myself, but sadly, not in a resto where it is supposed to be a pricy menu item. Would not order it based on just looking at a neighbor’s table either. is this already on the menu? Footloose, what a way to start my Monday working, minutes before embarking to my deskjob. Your notes always amazes me, and with the menu for today, hahaha, plus my white chocolate mocha coffee (from Starbucks – coffee of the day – (cheapest), ayos na talaga ang umaga, kahit na ang breakfast sandwich ko eh bacon egg torta at hindi crab. Di-bale, half-moon na rito, mga 3 more days full moon na, and I have been waiting for it, kasi ganong period matataba ang crabs, ready na akong magluto ng chili crab, but I am going to set-aside some para sa recipe ni MM. Thanks. Oh wow, is this on the menu? Why not roll it like an omelette or flip it like a torta? Tortang alimasag is one of my childhood faves during family gatherings. My grandmother would stuff it back in its shell and dunk it in frothy egg before frying it, so there are crispy bits from the egg. I remember it had red bellpepper and cabbage mixed with the crabmeat. I don’t think I’ve ever had tortang alimasag not in its shell. Another torta fave is tortang talong. You do have to charcoal grill the talong to get the best smoky flavour. Maybe try it with the lechon sisig instead of ground pork? I love anything CRABS! :) and we do put tomato ketchup with our crab omelettes too! Tortang alimasag — how can I not love this dish? I grew up in Sorsogon where the quality of alimasag and alimango is tops and we don’t really need to stint on crab meat. 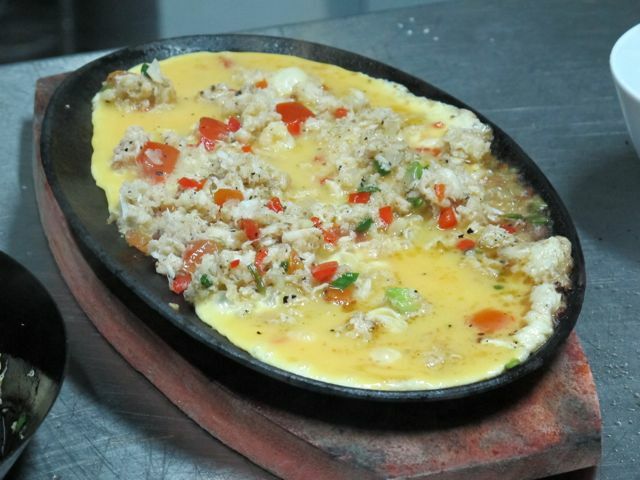 Here in Manila, it’s not that easy to find crab omelette that tastes just as good. I think I’ll try this open-faced version over the weekend so I can use (relatively) fresh-picked crab meat. Oh my, things like these make you do crazy things in the office… I shouldn’t read while doing reports on the side… it just made me hungry argh! Piles of mantao!!/mantou!! & Hot Sauce!! Yum!! I didn’t know crab meat is being processed in Bantayan, but now I understand why the big supermarkets in Cebu (Gaisano, Ayala) always have crab meat that you can buy by the kilo (or less). So great that Zubuchon is becoming a showcase of Cebuano food products. In university days, crab fooyung (sp?) from Aristocrat was the default dish for special occasions. I still feel that way about any crab dish today. Agree with Footloose on all levels. I’d like to eat this with garlic rice & sabaw ng sinigang on the side…mmm! extra rice pa nga! Yes, the mini torta/frittata would be the way to go. There’s a Korean market nearby where they portion the omelet out into 6 mini tortas. Pretty good…great with ketchup. The portability of the small torta/frittata would satisfy customers who don’t have time to sit down and enjoy a proper omelet. This would also translate into higher customer turnover and increased revenue. @MIllet, not only that putting vinegar to the water to steam the crabs so the meat does not stick to the shell, it also takes away the “fishy” (lansa) smell in the house when steaming or cooking crabs. if preparing those crabs is pain in the buri, then serve it with coconut milk, squash and sitaw. dont remove the meat from the shell.. just put the whole crab. this looks very delicious and something i normally do with supermarket-bought frozen crab meat….never tried the canned ones though. 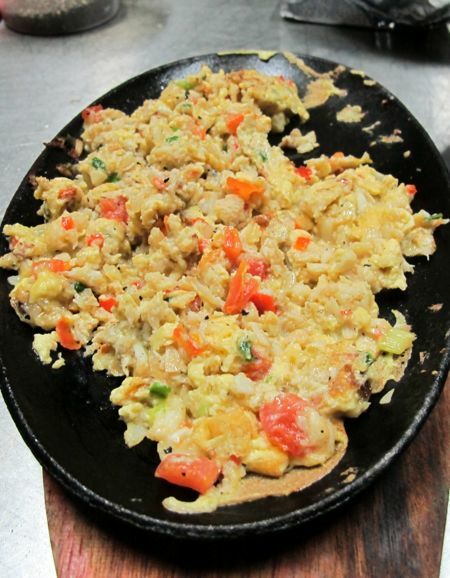 i’ve used crabmeat in fried rice and omellete. never tried a crab cake but will definitely experiment on that one soon. my mom used to make “KIAM PUNG” (Hokkien Chinese which literally means SALTY RICE) with leftover crab (usually from those thin long legs). she’d drop the crab meat in the rice cooker midway through the cooking cycle (plain and sticky rice), carrots, other veggies and a lot of soy sauce (which makes it salty). the outcome is similar to the “MA CHANG” rice dumplings you can buy from the supermarket or Chinese delis (Ongpin) but without the banana leaf covering. Hi is this included in your resto’s menu? Thanks! Now this is a true testament that you now have a symbiotic relationship with your loyal readers whose not afraid to call “spade” a spade. Big advantage is you acquired an intelligent forum as a test market, with an international flair if i may add. But, i’m sure you knew this all along, huh? Adding vinegar to boil crabs, now that is a gem that I have to try, you always learn something new from this site. I remember my Dad making use of the shell for his tortang alimasag, it’s my favorite but since my Dad is not getting any younger I don’t ask for it often, because I know that it is tedious to prepare. I also want it to be near perfect that not even a morsel of the crab shell shouldn’t be in my tortang alimasag or my apetite diminishes, that’s why my Dad, as OC as he was would make sure that ONLY crab meat sans the shell plus the rest of the ingredients should go to his recipe, The shell should only be used as a “container and/or mold” for the tortang alimasag. I love tortang alimasag and I like the novelty of cooking it yourself in a sizzling plate!great idea! I don’t find it messy-looking. That’s how I like my omelettes – curds punctuated by the main dish, with a smattering of onions, tomatoes and bell peppers. Crab scramble as I called it as a kid, it is the ultimate realization of my crab dreams. I could have my crab meat and eat it too. You see, I only learned how to “shell” crabs less than a year ago. Heehee… this was my pang-tamad way of getting crab. If this is already on the menu, mapapa-aga ang pag-Cebu ko! How about talong torta and stuff crabs in the shell? I also like the salted fish fried rice in chinese restaurants, it’s a meal by itself. Beef tapas are also good comfort food. Torta crab is also a staple in our house. Great post. I absolutely love me some crab. I grew up on a island and used to eat a whole lot of it. Now that I have moved i do not eat crab like i used to. I miss it. I would love to try some crab spaghetti.